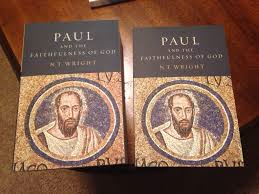 Home » Uncategorized » What is the “Big Idea” behind N. T. Wright’s Big Book on Paul? What is the “Big Idea” behind N. T. Wright’s Big Book on Paul? Recently I sat down with N. T. Wright, Research Professor for New Testament and Early Christianity at the University of St. Andrews. Professor Wright, I tell my students that every good book, every important book has a “big idea.” What is the “big idea” behind your book, Paul and the Faithfulness of God (Fortress 2013)? The big idea is to see how Paul does something which I think he is not usually given credit for, which is that he basically invents something which in hindsight we could call Christian theology. Now that may seem rather odd, because didn’t the Jews have theology? Well they did and they didn’t. Didn’t the pagans have theology? Well not really. They talked about the gods but that wasn’t a big topic of analysis. Paul has this vision that because of who Jesus is, because who the Holy Spirit is, everything that they had known about God as in the Jewish Scriptures has to be reworked from top to bottom, particularly for this reason: that Paul believes that what has happened through Jesus, his death and resurrection has radically defined the people of God so that the people of God are no longer defined as they were in Israel by circumcision and the Sabbath and the food laws and the things which marked out Jewish people from their non-Jewish neighbors. So if you are going to have a community which is a single community which is very important for Paul, the unity of the church is very, very important for Paul–not for us and that’s a problem by the way but a topic for another conversation. If this community is to be united and holy but without those markers to keep it place, how are you going to do that when Paul’s answer is that the whole community needs to be involved in this prayerful, worshipful, Scripture-soaked reflection on who God is, who God’s people are, and what God’s future is for God’s world. So in a sense this book is about Pauline theology and I expound all the details of Pauline theology, but back of that is this sense that Pauline theology as a whole is something which he is doing with his congregations because he realizes that without that they are not going to be able to be the people they are called to be. They way I put it is this. You know this saying: “Give someone a fish and you feed him for a day. Teach him to fish and you feed him for life.” Paul isn’t content just to give people dogmas: “Here is a true doctrine which you ought to believe.” He does that and that will help for a while. What he wants people to do is to grow up in their thinking, to mature as Christians in their thinking, so that then they will be able to sustain their life and the life of the church in days to come because he won’t always be just to tell them: “believe this, don’t do that, whatever.” So teaching people to think Christianly which then emerges as Christian theology. That is the heart of it. By David B. Capes in Uncategorized on March 24, 2014 .